Justice Minister attacks Yossi Klein's Haaretz article that claims national religious judge cannot judge fairly. 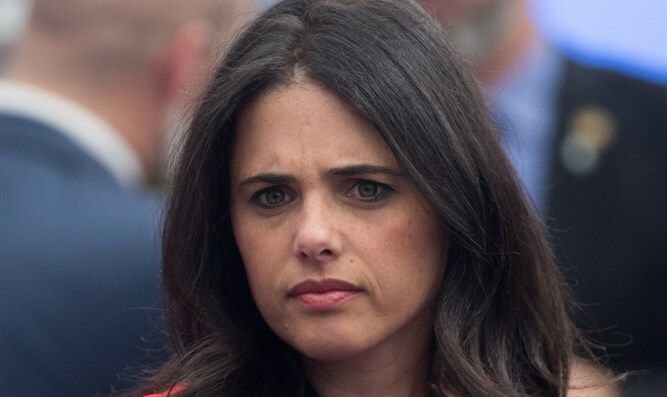 Justice Minister Ayelet Shaked (Jewish Home) sharply attacked an article published by journalist Yossi Klein in Haaretz, in which Klein claims a national religious judge cannot judge Arabs fairly. "Another antisemitic article from the school of Yossi Klein, which presents an imaginary dilemma of religious judges' 'dual loyalties'. Just as generations accused Jews in the Diaspora. Disgrace," Shaked said. In Klein's article he wrote, "The dilemma of religious judges is who are they most committed to: their faith, or the laws of their country? The question is whether a religious judge can honestly judge the law of work on the Sabbath, and if a judge who is both religious and national can fairly judge settlers and Arabs. The answer is: No. They cannot. "Faith can not and should not be taken from them, nor the ideology derived from that belief. Most of them are fair and honest. Most of them will rule only according to the laws of the State and won't try to sneak in the laws of the Torah. But what will they do when the laws of the State contradict those of the Torah?" he asks. In the past Yossi Klein claimed that national religious Jews are more dangerous than Hezbollah. Later, he partially retracted and told Radio Galei Yisrael, "Take out the word Hezbollah ... If Yossi Klein knew that the word Hezbollah was more irritating, he would easily have replaced it with another word. "If the word Hezbollah interfered with so much, I solemnly announce that I'm removing it from the article," added Klein. However, Klein attacked Jewish Home Chairman Naftali Bennett. To the question of whether Bennett was more dangerous than Nasrallah, Klein answered "Yes. Hassan Nasrallah can, should, or might be eliminated. I don't talk about Naftali Bennett that way, but he's much more dangerous because he can't be hurt because he's strong. Stronger than Nasrallah in the manner in which he controls the course of government and the moves of a state that I think are causing damage to the state."